Furnace repair service by experienced and reliable furnace technicians, anytime day or night 24/7 call our furnace repairs support at 1-(888) 808-2461 and we will send a technician to quickly repair your furnace at home so that you can get back to the comfort you want. We pride ourselves with great customer satisfaction, our furnace repair service objective is to get your furnace to work again not to push you to replace it if there is no real benefit to you. We have access to furnace repair parts, just try to mention the make and model of your furnace when you call us so that our furnace repair technicians will come equipped with the parts most likely needed for your specific furnace model. Yes, we understand a furnace can break anytime day or night which is why we have a 24/7 furnace repair line at 1-(888) 808-2461 including emergencies, we show up fast and we show up ready to fix your furnace. Our technicians provide upfront and simple to understand pricing based on work hours and parts to guarantee your satisfaction. 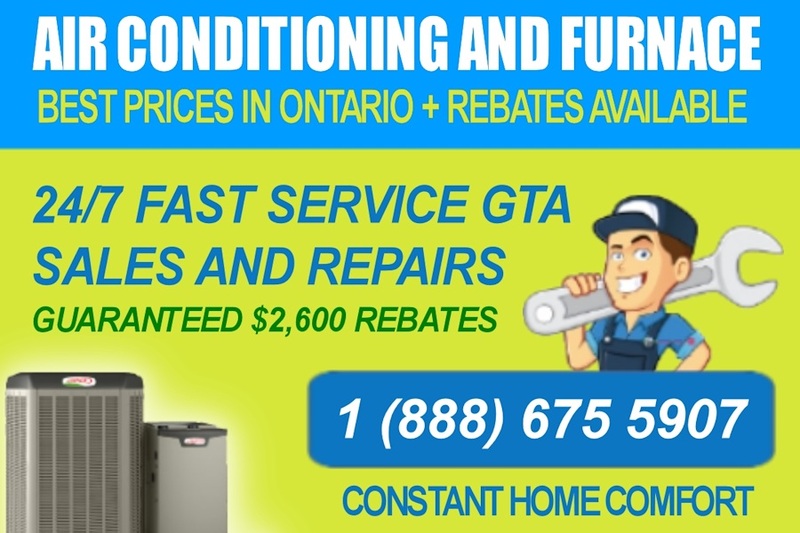 The Constant Home Comfort furnace repair service team is available in the Greater Toronto Area (GTA) more specifically in Toronto, Etobicoke, Scarborough, Vaughan, Richmond Hill, Markham, Newmarket, Aurora, Oakville, Mississaua, Burlington, Hamilton, Ajax, North York, Pickering, Oshawa and can be at your home within the hour day or night. Facing furnace or A/C issues? Now you won’t have to deal with them anymore. Constant Home Comfort guarantees you high quality and comfort at home by offering repairs for your heating and cooling units. Be it the chilly winters or the hot summers, our team of licensed technicians and HVAC experts promise you professional and reliable in-class assistance in the GTA. They are available 24/7 to help you out if your furnace breaks down or your air conditioner is not providing proper cooling and you don’t have to wait for hours for them to arrive. We believe in getting things done right in an efficient matter. Your satisfaction is our responsibility! Sometimes, heating and cooling systems give up on us when we really need them. Especially, in the GTA where we get to experience extreme weather conditions during most part of the year. An emergency in such a situation can be really inconvenient. But how would you know if there is/might be a problem with your furnace or A/C? Here’s a list of common problems with furnace and air conditioners that are signs for an immediate repair. Not to forget, we can fix them for you! Common issue may be linked to the supply of gas, no spark or other mechanical or electrical issues as it may be, we will carefully check your furnace to point out the specific issue and what we are about to do to repair the furnace including if required replacing broken parts in the furnace with new parts. There could be many reasons for the furnace to not work such like faulty ignitions or power switches, thermostat or electric panel cycling your furnace off and on continually or just really strange loud noises during operation. If you feel sudden drops or increase in temperature levels in the house, this is definitely an indicator of an HVAC problem. Or if some rooms of the house are a bit too warm or colder than the others, there is an issue of proper air distribution which might be due to faulty ignition control or cracked heat exchanger that needs to be addressed soon. Filters need to be cleaned regularly. Dirty filters reduce the performance efficiency of the heating furnaces and air conditioners. If you haven’t got your filters checked in a few months, then you must consider getting it serviced right away. When furnace vents are blocked by snow, dust, garbage or insects slipping into them from the outside, it can lead to improper functioning of the heating system. A furnace repair technician can help inspect and resolve this issue for you well in time. If you are facing an issue with turning on the furnace, there might be multiple thermostat problems associated with it including dirt accumulation, improper settings or faulty batteries. Consider replacing your thermostat for better performance. In case if the furnace or A/C system is making scratching or squeaking sounds, chances are the ball bearings have worn out or other loose parts are causing friction. This issue arises if the heating furnace or the conditioning system has not been maintained for a longer period. Why Should You Choose Constant Home Comfort For Furnace & A/C Repair? Furnace and A/C issues can wreak havoc on the comfort of you and your family, especially on days where the temperature is extreme on either end of the spectrum. Our team values your comfort and good health which is how we promise to ensure you a comfortable experience at home. Our certified team of HVAC experts has over 10 years of experience in providing the best installation, maintenance and repair services services in the GTA. Our services have been renowned for great professionalism, exceptional turn-around time and assistance, transparency, flexibility, and cost-effectiveness. You can avail our services any time during the day or night. We are available at your call for 24 hrs. We are known for a simple, flexible, competitive and affordable pricing structure with frequent rebates. What Do We Offer With Our Repair Services?